A 5-month old girl with no adverse prenatal, perinatal, and postnatal events, presented with a history of flexor spasms in clusters for one week. On examination, there was central hypotonia with normal head circumference and unremarkable fundus findings, with absence of neurocutaneous stigmata, facial dysmorphism or organomegaly. 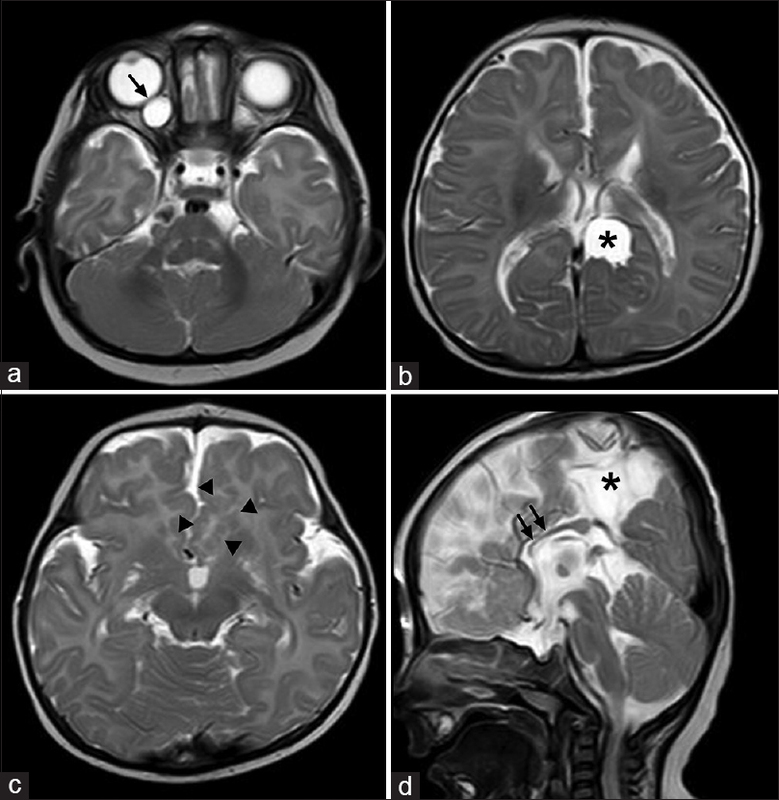 Neuroimaging complemented the diagnosis by fulfilling the triad of features of this dreaded X-linked dominant disorder [Figure 1]a,[Figure 1]b,[Figure 1]c,[Figure 1]d Magnetic resonance imaging (MRI) of the brain, T2 weighted axial (a-c) and sagittal (d) images revealed partial agenesis of the corpus callosum (double arrows), with an interhemispheric cyst (asterix). The left frontal lobe showed a thickened cortex with polymicrogyria (arrow heads) in the basifrontal region. Retrobulbar colobomatous cyst was also seen in the right orbit (black arrow). Aicardi syndrome is a clinicoradiological diagnosis where the classical triad comprises agenesis/dysgenesis of the corpus callosum, infantile spasms, and distinctive chorioretinal lacunae., As no gene or candidate region on the X chromosome has been definitively identified, the presence of this clinicoradiological triad remains the sole diagnostic feature of this entity. Neurological examination of these patients is nonspecific with variable findings. Some of the commonly encountered features include microcephaly and appendicular hypertonia with axial hypotonia. Historically, Aicardi syndrome presents with preexisting moderate-to-severe delay in milestones with recent-onset infantile spasms. The onset of seizures usually occurs in infancy, where approximately two-third of the affected children develop seizures in the first 6 months of life, which are usually refractory to medical treatment. Other phenotypic features that may be associated include costovertebral anomalies, distinct facial features, pigmentary defects of the skin, and small hands; however, they were absent in the index case. Recently, Aicardi syndrome has been recognized as a complex neurodevelopmental disorder. The presence of the classical triad is not essential for establishing its diagnosis; it has been discovered to have a wide spectrum of additional neuronal as well as extraneuronal manifestations. Sutton et al., proposed a modified diagnostic criteria, wherein he described that no additional characteristics are required for its diagnosis in the case all the three diagnostic features are present, viz.agenesis/dysgenesis of the corpus callosum, infantile spasms, and chorioretinal lacunae; they also stated that the presence of atleast two of the classical features with any two additional features also strongly suggest the diagnosis of Aicardi syndrome. These additional features include cortical malformations (polymicrogyria in the majority of patients) along with optic nerve/disc coloboma, cysts around the third ventricle or choroid plexus, subcortical heterotopias, split brain electroencephalogram, micro-ophthalmia and rib cage anomalies. Hopkins et al., described the neuroradiological findings in the largest cohort of patients. Describing the cranial magnetic resonance imaging findings of 23 girls, they found that all of them had polymicrogyria (predominantly frontal) and periventricular nodular heterotopias and, 21 of the 23 girls had an intracranial cyst; all of the above-mentioned abnormalities were present in the index case discussed in the present study [Figure 1]a,[Figure 1]b,[Figure 1]c,[Figure 1]d.
Rarely, this syndrome may present with normal developmental milestones and with no episodes of seizures. Awareness regarding the modified diagnostic criteria proposed by Sutton et al., is quite useful and may have significant implications in the genetic and antenatal counseling. Aicardi J. Aicardi syndrome. Brain Dev 2005;27:164-71. Sutton VR, Hopkins BJ, Eble TN, Gambhir N, Lewis RA, Van den Veyver IB. Facial and physical features of Aicardi syndrome: Infants to teenagers. Am J Med Genet A 2005;138A: 254-8. Hopkins B, Sutton VR, Lewis RA, Van den Veyver I, Clark GD. Neuroimaging aspects of Aicardi syndrome. Am J Med Genet A 2008;146A:2871-8.